Objectives Job stressors are known determinants of common mental disorders. Over the past 10 years, there has been evidence that job stressors may also be risk factors for suicidality. The current paper sought to examine this topic through the first comprehensive systematic review and meta-analysis of the literature to date. Methods We used a three-tier search strategy of seven electronic databases. Studies were included if they reported on a job stressor or job-related stress as an exposure and suicide ideation, self-harm, suicide attempt or suicide as an outcome. Two researchers independently screened articles. All extracted effect estimates were converted to log-transformed ORs. Results There were 22 studies that were included in meta-analysis. Overall, exposure to job stressors was associated with elevated risk of suicide ideation and behaviours. The OR for suicide ideation (14 studies) ranged from 1.45 (95% CI 1.01 to 2.08) for poor supervisor and colleague support to 1.91 (95% CI 1.22 to 2.99) for job insecurity. 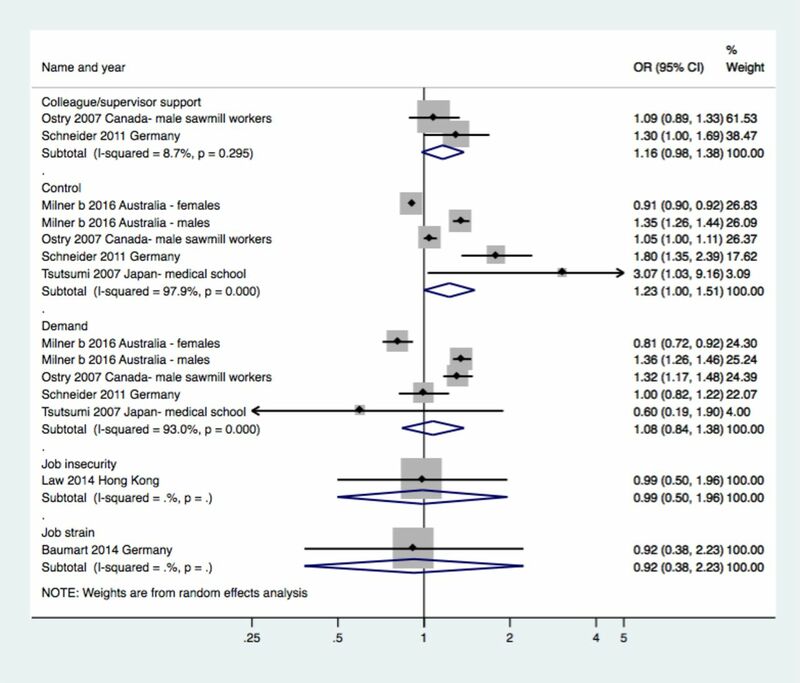 For suicide (six studies), exposure to lower supervisor and collegial support produced an OR of 1.16 (95% CI 0.98 to 1.38), while low job control resulted in an OR of 1.23 (95% CI 1.00 to 1.50). There were only two studies that examined suicide attempt, both of which suggested an adverse effect of exposure to job stressors. Conclusions This study provides some evidence that job stressors may be related to suicidal outcomes. However, as most studies in the area were cross-sectional and observational in design, there is a need for longitudinal research to assess the robustness of observed associations. Exposure to poor working conditions, such as low job control, high demands and effort–reward imbalance, have been associated with poor mental health across a range of studies.5–10 There is also evidence from observational studies that improvement in psychosocial conditions are associated with better mental health.11 Thus, there is some evidence that these are modifiable factors and that acting on these has the potential to lead to improvements in mental health. Close to 10 years ago, a number of researchers provided comment about the possibility that adverse working environments could also comprise risk factors for suicide.12 13 Since this time, there have been a number of papers on the topic, all of which have supported the idea that poor working conditions are related to risk of suicide ideation14 and suicide death.15–17 In addition to this, there is evidence to suggest that suicide rates are higher in occupations with poorer working conditions (eg, construction workers, labourers, forestry workers and agricultural workers and police) than occupations where the overall psychosocial environment is more positive (eg, professionals, managers and other highly skilled jobs).18 While there have been a number of studies on the relationship between psychosocial job stressors and suicide, these have tended to be based on limited sample sizes, which has limited statistical power to detect effects. 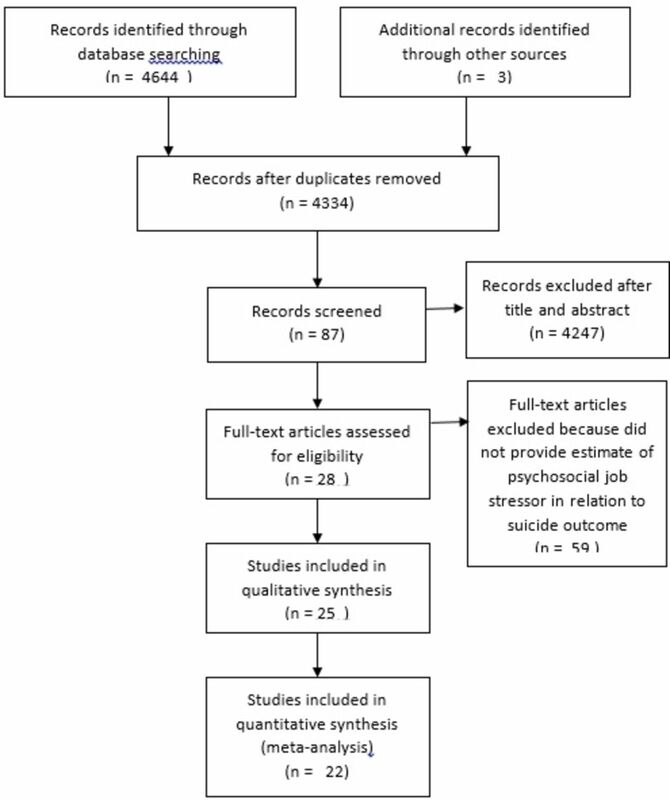 Considering the substantial amount of policy and research on the relationship between psychosocial job stressors and suicidality in recent years, we sought to examine the full evidence base on this topic through systematic review and meta-analysis, thereby building on past narrative reviews.12 13 In this review, therefore, we sought to investigate whether exposure to job stressors was associated with a greater risk of suicidal ideation and/or behaviours. We conducted a systematic search of seven electronic databases that index literature from a wide range of disciplines including medical science (Embase, PubMed and Web of Science), public health (Global Health), psychology (PsycINFO) and social science (ProQuest and Scopus). All databases were searched for eligible studies from their start date until 30 January 2017. We used a three-tier search strategy to identify eligible studies. At the first stage, keywords related to psychosocial job stressors and working contexts were combined (eg, ‘job stress*’ OR ‘psychosocial job stress*’ OR ‘working condition’). We then searched for common terms for psychosocial job stressors (eg, ‘job control’ OR ‘job demands’ OR ‘job secur*’ OR ‘job insecur*’). At the third stage, we searched for keywords inclusive of self-harm or suicide (eg, ‘selfharm’ OR suicid* OR ‘attempted suicid*’ OR ‘suicid* thought*’). We then conducted a search incorporating the search terms from tiers one, two and three using standard Boolean operators. A full list of the keywords can be seen in online supplementary file 1. Keywords were adapted for the specific requirements of each electronic database. Truncation and wildcards were introduced where necessary to increase the sensitivity of the search. No restrictions were placed on publication status or language, but if we were unable to obtain adequate details for data extraction, these were later excluded from meta-analyses. Reference lists of identified studies as well as prior relevant reviews in the field12 13 20 were additionally hand screened to identify further relevant studies. Experts in the field were also contacted to assist with the identification of ongoing evaluations. Studies were included in the review provided they satisfied the following inclusion criteria1: included a job stressor or job-related stress as exposures or risk factors and2 included suicide ideation, self-harm, suicide attempt or suicide as an outcome (either as a primary or secondary outcome). Studies were also included that used the following designs: prospective cohort, case–control, retrospective mortality, cross-sectional or intervention trial (eg, either predesign or postdesign, or randomised controlled trial). Titles and abstracts of retrieved records were evaluated using a two-stage screening process. At the first stage, studies with relevant titles were selected for second screening by two of the authors working independently of one another (AM and KW). At the second stage, only those studies satisfying inclusion criteria following a review of the full text were retained. Disagreements were resolved by consensus between two of the review authors (AM and KW). Methodological information extracted from each study included the location of the study, time period the study was conducted, author names, description of studied sample, study design, exposure definition and outcome definition. For each exposure, effect sizes were recoded so that higher values represent greater exposure to poorer psychosocial job stressors. Data extraction was checked for accuracy between three authors working independently (KW, AM and IN). All effect size estimates were considered, including odds ratios (ORs), rate ratios, relative risks and correlation coefficients. However, raw data were extracted as a preference over aggregated effect measures to enable estimation of unadjusted associations between each psychosocial job stressor and suicidality. Estimates needed to present either an SE or 95% CIs to be included in meta-analyses. Alternatively, studies needed to provide raw data so that the SE and CIs could be calculated. Data were pooled between studies using the OR and its 95% CI. This necessitated conversion between the different effect size statistics reported in the original studies. Specifically, for continuous outcomes, we converted data presented as Pearson’s correlation to a standardised mean difference using guidance from Borenstein,21 which then allowed us to convert the standardised mean difference to an OR. All ORs were coded so that higher scores represented greater exposure to poorer psychosocial job stressors. All ORs and their 95% CIs were log-transformed to allow for meta-analysis. The pooled OR represents the risk of suicide associated with the exposure of interest (eg, each job stressor) compared with those who were not exposed to this stressor. Where possible, we conducted separate analyses for males and females. A total of 4644 records were identified following the systematic search strategy outlined above. A further three were obtained following correspondence with researchers working in the area. Following deduplication, this was reduced to 4334. Of these, 4247 were excluded at the first screening stage, and a further 59 were excluded following application of the inclusion and exclusion criteria at the second screening stage. A total of 25 records were therefore included in the present review comprising 22 independent, non-overlapping studies (figure 1). Of these, we were able to extract data from 22 studies for quantitative meta-analysis. PRISMA flow chart. PRISMA, Preferred Reporting Items for Systematic Reviews and Meta-Analyses. These studies investigated a wide range of psychosocial job stressors, including poor colleague or supervisor support,16 27 30 32 36–39 low job control,14–17 29 35–37 39 42 high psychological job demands,14–17 27–29 31 35–37 42 job strain,14 26 33 effort–reward imbalance,14 28 35 job insecurity,15 28 33–35 44 role conflict,38 39 long working hours and shift work.32 38 40 44 There were a number of studies that did not report specific psychosocial job stressors, but rather reported associations with a measure of ‘general’ self-reported job stress, which is more proximal to suicidality than job stressor exposures, as job-related stress or distress is a response to job stressors16 26–28 30 31 40 43 (please see table 1). Figure 2 shows the results for different exposures and suicide ideation. Across all psychosocial exposures, there was an elevated odds of suicide ideation. The OR ranged from 1.45 (95% CI 1.01 to 2.08) for poor supervisor and colleague support to 1.91 (95% CI 1.22 to 2.99) for job insecurity. However, the I2 was high across all studies. We also assessed pooled results for general self-reported job-related stress for five studies,27 28 30 40 43 producing an OR of 1.53 (95% CI 0.99 to 2.38, I2 88.8%). Exposure to any job stressor was associated with an OR of 1.16 (95% CI 1.13 to 1.19). However, the validity of conducting a pooled analysis of all stressors is somewhat questionable given the large number of different exposures included in the estimate. Psychosocial job stressors and suicide ideation, males, female and all persons. We identified only single studies of specific jobs stressors in relation to suicide attempts, precluding meta-analyses for this outcome. In one study, exposure to poor colleague and supervisor support (OR 1.19, 95% CI 1.18 to 1.21) and low job control (1.04, 95% CI 1.04 to 1.04)37 were associated with an increased odds of suicide attempt. One other study found that general self-reported job-related stress was associated with higher risk of suicide attempt (2.62, 95% CI 2.19 to 3.13).31 Exposure to any job stressor was associated with an OR of 1.17 (95% CI 1.11 to 1.24). Figure 3 shows the results for suicide death for males, females and all persons. There was a higher risk of suicide associated with lower supervisor and collegial support (OR 1.16, 95% CI 0.98 to 1.38) and low job control (OR 1.23, 95% CI 1.00 to 1.50). There were no significant associations between job demands or job strain and suicide death. Although not included in figure 3, we also calculated a pooled effect for general self-reported job-related stress from two studies16 26 (OR 1.48, 95% CI 0.94 to 2.32, I2 29.0%). Exposure to any job stressor was associated with an OR of 1.17 (95% CI 1.03 to 1.34). As we note above, it is necessary to acknowledge the large number of different exposures that was included in this analysis. Psychosocial job stressors and suicide death, males, female and all persons. As a sensitivity analysis, we removed females from this analysis, given that the epidemiology of suicide is vastly different for males and females. This may have affected the result for job demands, which was non-significantly associated with death for males (OR 1.16, 95% CI 0.57 to 2.36, I2 88.5%). The OR for colleague and supervisor support decreased to 1.09 (95% CI 0.89 to 1.33, I2 98.6%), while the OR for job control increased to 1.29 (95% CI 1.19 to 1.40, I2 100%) for males only. Meta-regression indicated that a large part of the between study variance is driven by the difference in study populations (eg, occupational vs general cohort) (36.95%), country (23.11%) and study design (21.62%). In particular, results regarding study design found that cross-sectional studies were much more likely to identify a significant and positive association between job stressors and suicidality than other designs. A much smaller proportion of the between study variance was driven by gender (3.25%) or year (1.85%). Funnel plots for suicide ideation and deaths can be found in online supplementary file 2. These suggest that analysis was potentially affected by an absence of studies finding non-significant associations between exposure to adverse psychosocial working conditions and suicidal ideation and/or behaviour. As a final sensitivity analysis, we removed Wall et al 38 from the analysis of working hours as this represented work–family conflict. Pooled results were largely unchanged (OR 1.69, 95% CI 0.85 to 3.34). Our review included 22 independent studies, which examined suicide ideation, suicide attempt and death by suicide. The studies included a wide range of sample types (eg, occupation specific vs working population based) and were set in a diverse range of countries. Across this broad range of studies, results of this review suggest that exposure to various psychosocial job stressors was associated with elevated risk of suicide ideation, attempts and death. Job insecurity was associated with higher odds of suicide ideation, while job control appeared to be more of a risk for suicide attempt and death. There were a number of limitations that must be taken into consideration when interpreting these results. While we assessed a wide range of job stressors in this review, it was not feasible to include all possible adverse experiences at work. The studies identified by our search strategy mainly focused on modifiable task-based stressors, most of which are likely to represent chronic rather than episodic conditions occurring in workplaces. Other stressors that occur in workplace settings that we did not include in this review include bullying and harassment, which have been shown to be related to suicidality in a recent systematic review.20 There may be other, more acute stressors that increase the risk of suicide not considered in this review, such as workplace restructuring or exposure to traumatic incidents at work (such as those experienced by police, firefighters and other emergency responders). Considering this, our review undoubtedly underestimates the complexity of the workplace and the influence it may have on a person who thinks about, attempts and/or dies by suicide. Though our primary interest was in job stressor exposures as suicide risk factors, some studies only included measures of job-related stress or distress. These were included for completeness, though should be distinguished from job stressors as generally more proximal to mental health and suicidality outcomes,12 as reflected in results by the relatively high summary ORs compared with specific job stressors. The other limitations of our review were connected to its methodology and the methodology of the studies we included. As the majority of the studies in this review were cross-sectional, self-reported exposures and outcomes (eg, suicide ideation and attempts) dominated. We found that cross-sectional studies were more likely to identify an association between job stressors and suicidality outcomes than prospective studies. There is therefore the potential for common method variance and inflated associations and for reverse causality (as it is impossible to identify whether the exposure to job stressors occurred before suicidality). There is also the possibility of health selection in those studies that reported suicide mortality, whereby those people who were more vulnerable to suicide were also more likely to be employed in, or to report, poor psychosocial working conditions. A number of analyses resulted in quite a high I2 , which suggests there was substantial heterogeneity between studies. This may be driven by the diversity of sample types, countries, exposure measures (and how these exposures were measured) and outcome measures we included. It is also important to highlight the potential for publication bias, as most studies suggested that there was an adverse effect of psychosocial job stressors on suicide outcomes. We would acknowledge that we did not control for socioeconomic factors in the meta-analysis. It is possible that socioeconomic status to some extent confounds relationships between some stressors and suicidality (eg, low job control patterns by occupational skill level and socioeconomic status). Notwithstanding these considerations, our review has a number of strengths, including the large number of studies we were able to include, large sample size and the thorough methodology we used. We noted some evidence of gender differences in the relationships between job stressors and suicide. For suicide, the available data suggest that males exposed to job stressors are at much greater risk than females.15–17 37 This would align with research evidence on suicide among males more generally, which has consistently shown that males are particularly vulnerable to external social and economic stressors.46 Although, we would note that these are not the same as job stressors. Associations might also differ across occupational groups and country.28 33 44 For example, females in Japan exposed to job stressors were at elevated risk of suicide ideation.44 There was also some evidence of an elevated risk of suicide ideation among medical doctors,39 nurses14 and people employed in male-dominated manual labour occupations.14 However, the possibility that the relationship between jobs stressors and suicide is modified by occupation, country context and gender must be considered as hypothetical at this stage, given that not all studies produced stratified results. Regardless of the pathways through which it occurs, it is clear that job stressors are associated with increased risk of suicide. Thus, job stress prevention and control should be a key component of workplace as well as some other suicide prevention strategies.41 51 Furthermore, as poor psychosocial working conditions are highly prevalent, addressing these could have large population impacts in terms of reductions in suicidality. Indeed, a past study demonstrates the high population-attributable risk associated with socioeconomic factors for suicide comparative to mental illness.52 At the same time, it is clear that much more research is needed to unpack the complexity of the relationships between psychosocial job stressors and suicidality, particularly in regards to differences by country context, gender and occupation. We would like to thank Jean-François Chastang, who aided with data extraction and checking. WHO. What are social determinants of health? 2012 http://www.who.int/social_determinants/sdh_definition/en/ (accessed 3 Mar 2017).
. Effort-reward imbalance at work and health. In: Perrewe P L , Ganster D C , eds. Historical and current perspectives on stress and health, 2002:261–91.
. Job insecurity: review of the international literature on definitions, prevalence, antecedents and consequences, 2005.
. Chapter 7. converting among effect sizes. Introduction to meta-analysis: Chichester, West Sussex, U.K. 2009. 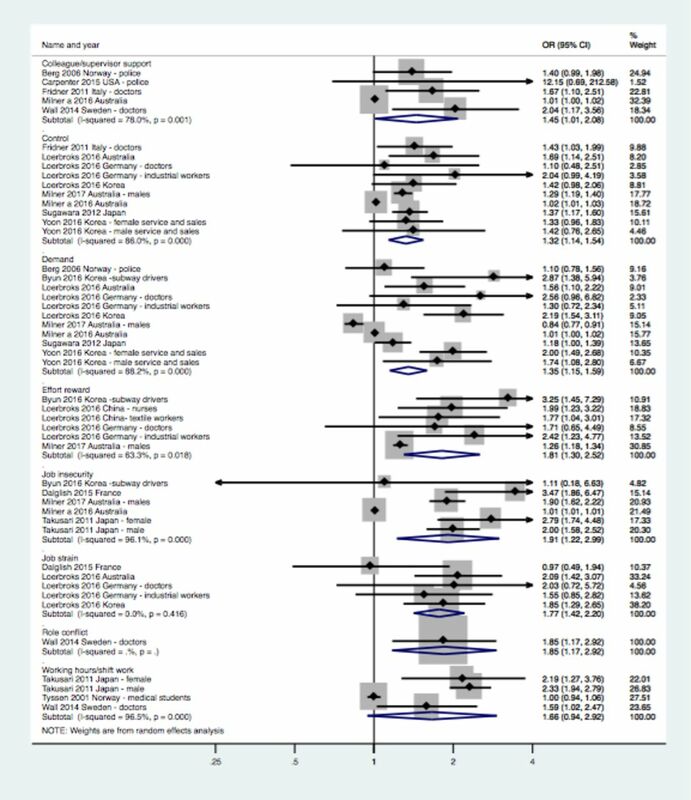 Hoboken: John Wiley & Sons, 2009.
. Funnel plots in meta-analysis. The Stata Journal 2004;4:127–41.
. METAN: Stata module for fixed and random effects meta-analysis. Boston: Statistical Software Components; Boston College Department of Economics, 2006.
. Meta-regression in Stata. The Stata Journal 2008;8:493–519.
. relationship breakdown, and suicide risk: A review of research in Western countries. Journal of Family Issues 2016;37:2239–64. Contributors AM conceived the study. AM and KW developed the methodology, conducted the searches, screened the articles and conducted data extraction. IN checked the data extracted. ADL commented on the draft of the paper, along with other coauthors. All authors contributed to the final manuscript. Funding The American Foundation for Suicide Prevention (SRG-1-091-13); Society for Mental Health Research and Deakin University provided financial support for this study. Correction notice This article has been corrected since it published Online First. The conclusions paragraph in the abstract, figures 2 and 3, and OR and CI results have all been corrected. Psychosocial job stressors and suicidality: can stress at work lead to suicide?